Germany has completed ratification of the European Constitution with an overwhelming vote in the upper house of parliament, the Bundesrat. The vote follows approval by the lower house two weeks ago. It was timed to provide support for the troubled "Yes" campaign in Sunday's French referendum. Former French President Valery Giscard d'Estaing, who helped draft the constitution, addressed the Bundesrat ahead of the debate. He told the upper house: "This is an historic event because Germany is one of Europe's founding countries and its most populous. "The day after tomorrow, I hope with all heart that the French are going to ratify this constitution through a referendum. "Ratification by Germany and France would mark an historic step forward for the future of the constitution and for Europe." The Bundesrat, merely completed the work done by the lower house, the Bundestag, two weeks ago. The BBC's Ray Furlong says that then, there was a small rebellion by some opposition conservative MPs, but the constitution received broad cross-party support and passed with a huge majority. The early passage of the constitution is intended to provide a boost to the "Yes" campaign in France ahead of Sunday's referendum there. Polls suggest that the "No" side has a lead of up to 10%. A maverick backbench MP is still calling for a German referendum, but it is not expected to come to anything. Our correspondent says that for the German political establishment, the constitution is just not controversial. 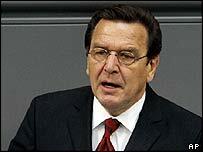 In any case, the main parties are now far more interested in preparing for a snap general election which has been called for September, a year earlier than scheduled, after Chancellor Gerhard Schroeder lost a regional election last weekend. The new French leadership faces a reforming challenge, writes Caroline Wyatt. What does French vote mean?